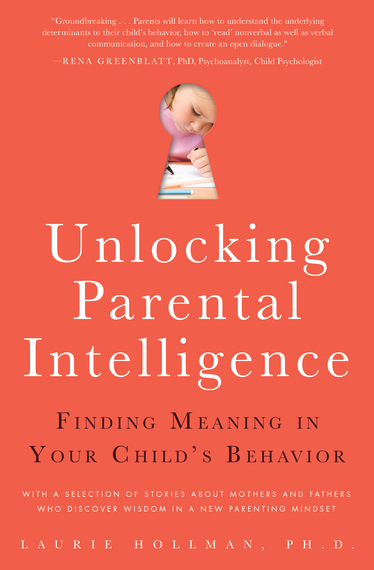 The Pixar animated movie, Inside Out, depicts in a remarkable way the threads behind the new book, Unlocking Parental Intelligence: Finding Meaning in Your Child's Behavior. When a young girl, Riley, is uprooted with her mother and father from their home in midwestern Minnesota to San Francisco, she puts on the veneer of a joyful face to please her parents who are struggling with the move. However, inside the "headquarters" of Riley's mind where literally colorful emotions are portrayed by a blue character named Sadness, a green figure named Fear along with their tendentious pals, purple Disgust and red Anger, the Joy character is unable to automatically lead the pack as Riley emotionally starts to fall apart. She bursts into tears humiliating herself in class on the first day of school as her feelings overwhelm her as she talks about missing her friends, hockey team, school, and former home. When Riley doesn't come home from school joyfully, but instead shows an 'attitude' at the dinner table, her father harshly sends her to her room only to guiltily find her there later distraught and unable to communicate with him. Joy and Sad take the center stage of Riley's mind as they juggle with her past happy memories that could be lost or tainted by Sadness if he gets a hold of them. They take a long journey inside Riley's mind trying to recover her balance as she loses hold of herself and plots to run away from her new unsettled home to return to Minnesota as if that will solve her emotional plight. At the same time Disgust, Fear and Anger ranglel with each other trying to get along in new ways without the lead of Joy managing them. This is where Parental Intelligence comes in. As the viewers, we begin to see how different emotions do not stay isolated but in fact affect each other. We begin to understand the machinations of Riley's complicated mind just like parents do when they unlock their parental intelligence. We take a journey into Riley's unconscious where joy and sadness affect each other and begin to work together to salvage Riley's psychological state. In the end, Riley gets her emotions together in an honest and genuine way as she decides not to run away after all (from her true self) but instead to come back to her new home to reveal to her parents her true mixed emotions. Having now unlocked their great Parental Intelligence, a wiser mother and father greet their daughter accepting all her mixed emotions affectionately validating Riley's struggles with the move to her new home. With parental Intelligence in tow, Riley's parents understand their child's emotions and thus her complex mind. This is a great shift for them from the time they expected her to only carry a joyful façade for the family. They have unlocked their parental intelligence and found their loving daughter once again. Now they are ready to problem solve with her the pain she is enduring which leads to a happy ending. Laurie Hollman, Ph.D., has a new book, Unlocking Parental Intelligence: Finding Meaning in Your Child's Mind, on Amazon, Barnes & Noble and wherever books are found.